1948 to 1973: The economy grew rapidly during this period at an annual rate of about 10%, which can mainly be explained by improvements in productivity. Growth was characterized by investment in the economy's infrastructure and a rapid increase in population, primarily due to the massive inflow of immigration during the 1950s and 1960s (see Patinkin, 1960 and Halevi and Klinov, 1986). 1973 to 1985: Known as the “Lost Decade” of Israel’s economic history, this period was characterized by significant growth in the government deficit, which was in large part due to the increase in defense expenditure. The decade can be summarized as follows: Economic growth fell off sharply as a result of the oil crisis, which began simultaneously with the Yom Kippur War, inflation accelerated rapidly until it reached levels bordering on hyper-inflation just prior to the Stabilization Plan of 1985 and the current account deficit and the level of debt, both internal and external, reached proportions that could not be financed in the long term and which brought the economy to the brink of collapse in the financial and foreign currency markets (see Ben Porath, 1989). 1985 until the present: This period, which began with the Stabilization Plan in July 1985 and continued until the present, will be the focus of this survey (see Bruno et al., 1991; Ben Bassat, 2001; and Liviatan and Barkai, 2004). The period can be characterized as a continuous process of economic reform, which led to a transformation from unusually heavy government involvement in the economy to a situation in which basic problems would increasingly be solved through market forces. The strategy of economic policy during this period was a combination of reducing the share of government spending in the GDP to lessen government involvement in the economy and the reduction of government debt through a continuous process of economic reforms that eventually created a market economy. Source: Based on Central Bureau of Statistics data. Israel's GDP reached NIS 714 billion in 2008 – equivalent to US$199 billion. Per capita income reached $27,200, which is about 81% of the figure for the OECD countries and about 60% of the figure for the United States. Output per worker stood at about 76% of that in the United States. It is worth noting that the positive developments during the period 2003–2007 led to a significant increase in Israel's per capita income, which offset to a large extent the effect of the recession years. Israel can be characterized as a small open economy with chronic shortages of raw material for domestic manufacturing. These characteristics dictate a specific structure for the economy in which raw materials are imported, thus requiring a strategy to increase exports to maintain current account balance. Israel's relative advantage lies in its knowledge-intensive hi-tech industries but because there is only a small domestic market for their goods, the output must primarily be sold in the global market. This means that while the Israeli economy benefited enormously from the globalization process, it also became more exposed to global shocks, particularly in the hi-tech industries. The comparative advantage of Israel in hi-tech products and services that, according to the Revealed Comparative Advantage Index,  ranked in second place amongst the OECD countries, after Ireland and, according to this index, Israel has maintained this position since the early 1990s. The majority of export products originate from the manufacturing sector, which accounts for about 20% of total business output while the export of services originates from the commerce and services sector, which accounts for the largest share of business output (about 60%). More than 40% of total industrial production has been destined for export in recent years, with about one-quarter of that being electronics and another quarter industrial chemicals, fertilizers and pharmaceuticals. The export of technology-intensive services accounts for more than one-half of Israel's export of services and includes R&D services, computer services, information technology and communications services. Approximately half of the technology-intensive export of services is destined for the U.S. and about one-quarter for Europe. Israel's labor market is characterized by a low participation rate, which is primarily due to the low rates among ultra-Orthodox men and Arab women. A low rate of participation is one of the main explanations for the difference in per capita income between Israel and the OECD countries. The Israeli economy is also characterized by unexpected demographic shocks. The most significant such event during this period was the wave of immigration from the Soviet Bloc countries that began in 1989 and brought more than one million immigrants within a short period of time. Israel is also subject to geopolitical shocks that effect economic performance. During this period, there were two intifadas and a sharp increase in terrorist attacks. These occurred in parallel to the political process that began in the 1990s at the Madrid Conference and continued through the Oslo Accords. During the first half of 1985, inflation reached its peak following unusually high deficits in the government budget and in the current account of the balance of payments. The Israeli economy reached the threshold of financial collapse following the crisis in the banking system in October 1983. This situation required drastic measures to quickly bring inflation under control and to reduce the deficit in the current account. In July 1985, implementation of the Stabilization Plan began to impose fiscal restraint by cutting government spending, raising taxes and abolishing subsidies. These conventional measures were combined with a strict contractionary monetary policy leading to a rise in the interest rate and the imposition of credit ceilings on the economy. Other unconventional policy measures were adopted, such as a freeze on wages within the framework of a package deal between the government, the national labor union (the Histadrut) and the employers, temporary price controls and the transition to a fixed exchange rate following a hefty devaluation at the beginning of the program. The Stabilization Plan increased the Bank of Israel’s freedom to manage and execute the monetary policy that was necessary to end inflation. This was accomplished within the framework of the “Non-Printing” law, which essentially prohibited the government from financing its budget deficit by printing money. These steps laid the foundation for an independent and effective monetary policy later on. The Stabilization Plan received one-time assistance from the United States government and the conversion of U.S. loans – for the financing of defense acquisitions – into grants. This plan brought about a transformation in Israel's economic reality: from a situation of close to hyper-inflation (of over 400%) to double-digit inflation (around 20%) by mid-1986 and eventually to the current price stability; and from an economy suffering from a chronic shortage of foreign currency due to large deficits and foreign debt to a manageable current account balance that can be financed in the long term and eventually to a current account surplus during the past few years. 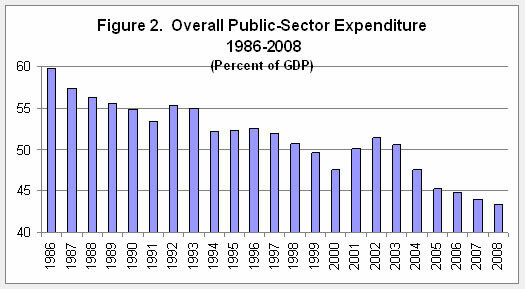 In retrospect, the increase in fiscal discipline, which was characterized by a substantial reduction in both public spending (from about 60% of GDP in the mid- 1980s to about 43% by the end of 2008) and public debt (from about 163% of GDP to about 78% in 2008), was primarily the result of a substantial reduction in defense expenditure – from more than 20% of GDP in the mid-1980s to less than 10% recently. This reduction was made possible by, among other things, peace agreements with Egypt and Jordan. The introduction of the Stabilization Plan in 1985 led to a drastic reduction in the public sector deficit – from some 14% of GDP prior to the imposition of the Stabilization Plan (in 1984) to surpluses during the three subsequent years and, later on, to deficits of significantly lower magnitudes, which resulted in a gradual reduction of public debt. The first two years after the introduction of the Stabilization Plan were characterized by a rise in GDP, a stable level of employment and a balanced government budget, although there was also an increase in the level of unemployment during this period, primarily due to the efficiency measures in the business sector. The years 1988 and 1989 were characterized by an economic downturn as the business sector adapted to the new economic reality following the success of the Stabilization Plan. This included, among other things, the restructuring of the Koor conglomerate, the termination of the Lavi jet fighter project and the outbreak of the first intifada. In sum, the Stabilization Plan succeeded in achieving its two objectives: Reducing inflation to a rate of around 20% and a significant reduction in the current account deficit. This success was supported by the U.S. grant in the amount of $1.5 billion (over a two-year period). The beginning of the 1990s was characterized both by a massive wave of immigration from the Soviet Union and by the globalization process, which intensified during the subsequent two decades. At the same time, the Israeli economy was becoming increasingly open and this paved the way for the major reforms implemented during the 1990s. These included the Deficit Reduction Law, an increasingly flexible exchange rate regime following the transition from a horizontal exchange rate band to a diagonal band. Also included was the transition to an inflation targeting regime, a policy of exposing the economy to foreign trade with countries that were not included within the framework of the trade agreements with the U.S. and the European bloc (particularly Asian countries), a reform of the capital market and the end of segmentation in the credit market. The wave of immigration had a number of effects on the economy: Domestic demand increased dramatically, which led to accelerated economic growth and a sharp increase in investment. The massive immigration was also characterized by a high level of human capital, which created the basis for a major increase in the size of the more advanced industries and led to accelerated development in the hi-tech industries, particularly from the mid-1990s onward. 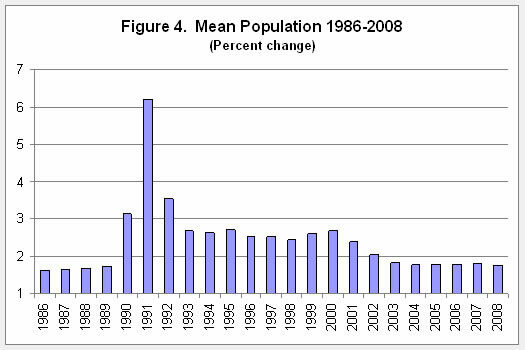 The considerable growth in the population brought about a sharp rise in the rate of unemployment, primarily during the years 1991-1993, alongside a downward trend in real wages and an increasingly competitive labor market accompanied by a decline in the influence of the Histadrut in the market. During the second half of the 1990s, once immigrants had been absorbed into the labor force, the rate of unemployment declined to levels that prevailed prior to the wave of immigration (between 6–7%). At the beginning of the 1990s, a global downtrend in prices began and, therefore, exchange rates were made more flexible with the adoption of a regime with a long-term commitment to inflation targets and a more flexible exchange rate policy. 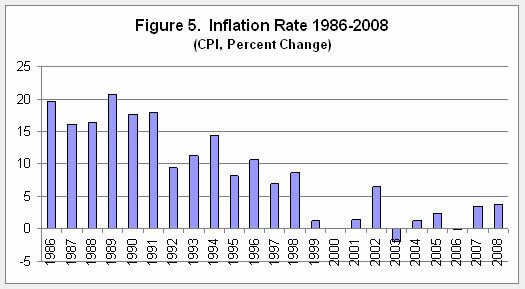 During the period 1992–1994, inflation decreased from a plateau of around 20% to 10%. Nevertheless, there were temporary fluctuations due to a number of geopolitical events, such as the weakening of the Arab boycott, the Oslo Accords with the Palestinians in 1993 and the peace agreement with Jordan in October 1994. This drop to a new plateau was the result of a number of factors, including the effect of the wave of immigration on the labor market (mainly through a reduction in wages), a reduction in the dollar prices of imports, a supply surplus in the housing market that reflected a significant reduction in demand, an increase in the interest rate and, finally, the passing of the Deficit Reduction Law. This law was introduced following, among other things, the increase in the deficit as a result of the wave of immigration and the desire to signal to the public that the government had not abandoned the objective of deficit reduction. During the period 1994–1995, however, following an extended timeframe in which there were no significant changes in labor agreements, it was decided to award a substantial wage increase to public sector employees, a move that undermined to a large extent the policy commitment to reduce the government deficit. In parallel to the adoption of the Deficit Reduction Law, the government decided, at the end of 1991, to adhere to a trajectory for reducing the rate of inflation by adopting an inflation-targeting regime. The main strategy of the Bank of Israel during this period was to maintain a non-inflationary environment while lowering the interest rate as much as possible to support real economic activity. In implementing this strategy, there was also a need to ensure that the policy did not affect foreign exchange reserves. Thus, as part of the Bank of Israel monetary policy from 1990 to 1994, the exchange rate constituted a nominal anchor and was allowed to fluctuate within a diagonal exchange rate band. In addition, until the end of 1993, the Bank of Israel acted to gradually reduce the interest rate parallel to the drop in the rate of inflation. This interest rate policy had two main objectives, which were sometimes contradictory: The first objective was to maintain the exchange rate within the boundaries of the band to reduce the vulnerability of the economy to the irregular behavior of the financial markets resulting from speculative activities in the foreign exchange market. The other objective was to stimulate real economic activity to facilitate the absorption of the wave of immigrants that arrived in the early 1990s. At the end of 1994, the Bank of Israel raised the interest rate to achieve a more ambitious inflation target that coincided with the rise in the rate of inflation. This new monetary policy halted the expansion of the money supply and the effect on inflation was felt in the following year. The year 1995 was characterized by a continued increase in the rate of growth; however, from 1996 to 1999 there was a consistent decline in the growth rate. The period was characterized by a gradually worsening slowdown, which was evident in the behavior of various economic indicators, including the unemployment rate, manufacturing output, the import and export of goods and services, housing starts and number of tourists. There were also a number of security-related events that raised the level of uncertainty in the economy, as did the early elections following the assassination of Prime Minister Yitzhak Rabin, which was accompanied by slower growth in global trade. With regard to structural changes in the economy, the positive effects of the wave of immigration were still not being fully felt in 1995. On the other hand, some of the business opportunities that resulted from the progress in the peace process were being exploited. One of the structural changes that resulted from the increased access to new overseas markets was the transition to production in advanced industries at the expense of traditional ones, which began in that year. The effect of these events was manifested in both positive and negative economic phenomena. 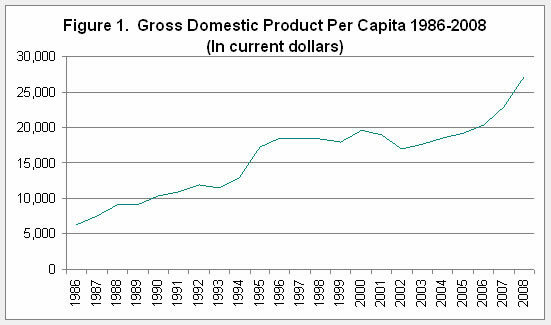 The former included growth in per capita GDP in 1996; an increase in investment in some industries; the import of long-term capital; and, in the labor market, a decrease in the rate of unemployment; so much so that the economy reached a state of almost full employment. On the negative side, a slowdown was felt in the rate of growth relative to 1994 and 1995. As in previous years, there was no increase in productivity, which partly reflected the less-than-full exploitation of human capital, particularly that of new immigrants, and of the technological improvements that were the result of investment in previous years. In addition, 1996 saw an increase in the current account deficit and a substantial increase in the budget deficit in the wake of the expansion of the public sector and an increase in the number of its workers, in addition to an increase in their real wages. Up until the middle of the year, there was an increase in prices due to an expansionary fiscal policy. In order to limit the negative effects of this fiscal policy on inflation, a contractionary monetary policy was adopted such that the Central Bank nearly met its inflation target. As a background to the developments in 1997, it is worth mentioning that the period of 1994 to 1996 was characterized by a partial abandonment of fiscal discipline; as a result of which important structural reforms of the economy were not carried out and the relative share of the public sector in the economy grew. During this period, the economy experienced high growth and a decrease in unemployment; however, at the same time, the deficit in the current account increased significantly and inflation reached double-digit figures, resulting in a rapid increase of the government budget deficit and excess demand in the economy. As a consequence of these developments, one of the main targets included in the 1997 budget was a decrease in the current account deficit. 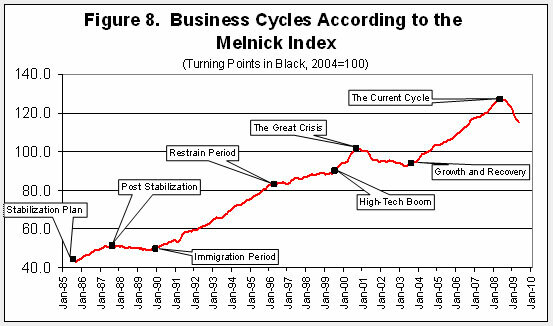 The year 1997 saw an end to the boom segment of the business cycle that had characterized previous years. This was due to a lessening of the impact of the wave of immigration, a decline in domestic demand and a decrease in investment, with the completion of the process of adjustment in the capital stock. Despite the decrease that year, the level of investment was still considered to be high. In contrast to previous years, fiscal policy in 1997 was contractionary; as a result, demand dropped off, leading to a decrease in the growth of public consumption and investment. The raising of tax rates brought about a decrease in disposable income which, in turn, caused a slowdown in the growth of private consumption. A contractionary monetary policy was manifested in a high real rate of interest (about 5%), which was identical to its level during the second half of 1996. This policy, which constrained supply and demand in the short term, was adopted in order to achieve the inflation target (which was indeed achieved) and to maintain the exchange rate within its band. In 1997, structural change in the economy was manifested in the contraction of traditional industries, such as textiles and clothing. This led to a transfer of manpower out of these industries, most of which was not absorbed into knowledge-intensive or service industries. As a result, the level of unemployment increased, which was accompanied by a slowdown in economic activity. The contraction of the traditional industries was a result of their inability to compete under the conditions created by globalization. The reality in Israel brought about a situation in which production costs were relatively high, in part due to the increase in the minimum wage and the increase in the dollar exchange rate relative to European currencies. There were also security-related events which increased political uncertainty and hampered trade with the occupied territories and the export of tourist services. An inevitable result of all this was the deferral of investment. 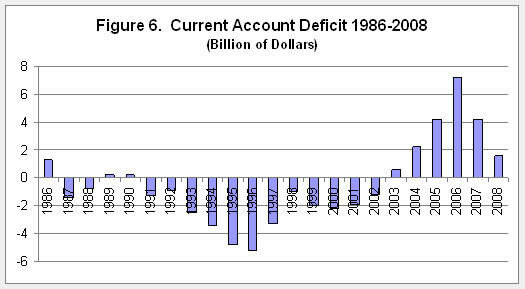 The current account deficit was reduced during this period to 3.3% of GDP, as compared to 5.2% in 1996. The yield spreads between Israel and overseas led to an increase in foreign investment and an expansion in credit denominated or linked to foreign currency. As a result of the widening of the foreign exchange rate band, there was an increase in exchange rate risk which drastically reduced the inflow of short-term capital, although the upward trend in foreign investment continued. Together with the decrease in the current account deficit, this led to an increase in foreign exchange reserves at the Bank of Israel, which reached a peak of $20 billion in 1997. This high number was also the result of large purchases of foreign currency by the Bank of Israel to prevent the exchange rate from declining below the lower boundary of the band. The slowdown in domestic demand and the increase in unemployment continued in 1998, in part due to the increase in the real interest rate, the slowdown in the growth of global economic activity and the political and security-related uncertainty. In contrast, there was an improvement in the current account, which resulted from the slowdown in domestic demand and the improvement in the terms of trade (involving a decrease in manufacturing costs, which led to an increase in the profits of exporters and weakened the effect of the global slowdown on the economy). Inflation decreased sharply up until August, but from August to November, there was a sharp increase in prices due to the devaluation of the shekel, which was a result of the financial crisis that started in Asia, spread to Russia and from there reached Israel. Up until August of that year, there was a feeling that inflationary pressures had abated and as a result the inflation target for 1999 was set at 4% in August and, at the same time, the Bank of Israel reduced the interest rate by 1.5%. Following a limited devaluation, the exchange rate settled at a lower plateau; however, the crisis in Russia, which included an announcement of a moratorium on debt servicing, as well as the shocks in the financial markets in its wake, reduced flows of capital to emerging markets. As a result, there was a significant drop-off in the flow of capital into Israel and a sharp devaluation in the exchange rate from the end of August until the end of October. There was a major increase in the inflation rate (and in the expectations of inflation) during this period. The Bank of Israel raised the interest rate by 4% without direct intervention in the foreign exchange market, which led to a considerable cooling-off in expectations of inflation along with a decrease in the price indexes from December to February. 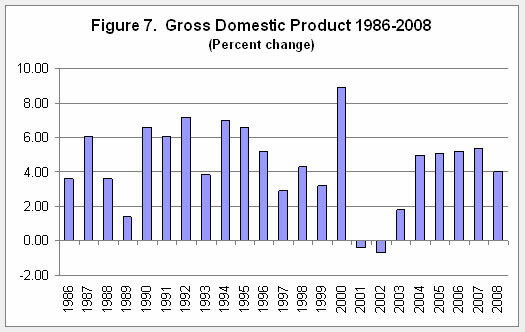 In 1999, there was a turnaround in economic activity, particularly during the second quarter. The acceleration of activity during this period was led by domestic demand and exports, related to the high-tech bubble. In addition, there was an increase in employment despite the increase in the rate of unemployment. The recovery followed three years of economic slowdown and was primarily based on long-term factors that acted to return the economy to a path of growth, in addition to transitory factors that acted to accelerate activity during this period. The slowdown in economic activity commenced in the last quarter of 2000 and was caused primarily by domestic and foreign shocks. In Israel, this involved the second intifada in the occupied territories, which had a direct effect on domestic economic activity; most clearly tourism and the construction industry. Abroad, this involved a global slowdown – primarily in the U.S. – which resulted from a global crisis in the hi-tech industries and the capital markets. These shocks led to a reduction in demand for domestic products which intensified the recession in Israel. During the period 2001–2003, the country experienced its most serious recession since the establishment of the State of Israel. The period started with sharp decline in the NASDAQ index of hi-tech shares, which led to a significant reduction in the investment in Israeli start-up companies and in the hi-tech industry as a whole. A tight monetary policy also contributed to the lack of growth, which was reflected in a significant decline in per capita income during 2001 and 2002. The developments in the U.S. economy, which included a declining rate of growth and a reduction in investment, led to a contraction in demand for Israeli exports. This period was also characterized by the opening up of global markets and an intensification of the globalization process, which were accompanied by a liberalization of the foreign exchange market. In 2000, inflation dropped to zero as a result of the Bank of Israel's tight monetary policy, which led to high interest rates on loans. The Central Bank urged the government to continue cutting the budget, thus reducing the deficit and the debt to GDP ratio, which during the period 2000–2001 reached its lowest level since the Stabilization Plan in 1985. From 2001 to 2003, there was a further increase in the rate of unemployment to about 10%, as compared to 6–7% during the mid-1990s. During the course of 2001, the Bank of Israel continued reducing interest rates without compromising the achievement of the inflation target until, at the end of December of that year, it lowered them by 2% - from 5.8% to 3.8%. This led to a sharp increase in the exchange rate during the first half of 2002 and a considerable increase in expectations of inflation. The outcome had been expected: 6.5% inflation, which represented a major deviation from the inflation target that year. The trend in prices during 2002 was not uniform: During the first half of the year, a mix of expansionary economic policies was implemented, which led to the continued growth of the deficit. This policy mix and the deterioration in the security situation created a lack of confidence, which increased the demand for foreign currency. As a result, the shekel was devalued by about 18% from the beginning of the year until July; a development which threatened Israel's financial stability. During the second half of the year, the deterioration in the financial markets was halted by a major change in the policy mix, which was reflected by the raising of the Bank of Israel interest rate by 4.5% by the end of June. As part of the policy mix, it was also decided to increase tax rates and to cut government spending while at the same time raising the deficit target to 3.9%, even though such steps tend to exacerbate the situation during a recession. The monetary and fiscal policy mix led to the return of relative stability in the foreign currency market as well. In 2002, the gradual recovery in global trade was not yet felt in the hi-tech industries and therefore despite the real devaluation, which had a greater effect on the exports of traditional industries, the downward trend in exports continued. The recovery in the exports of the hi-tech industries began only during the fourth quarter of 2002. Following the recession, which lasted from 2000 until the first half of 2003, a process of economic growth began and gained momentum from 2004 to 2007. This period was also characterized by growth in per capita income, a decline in unemployment rates, the achievement of the government's deficit targets, low inflationary pressures and a strong banking system. The economy's growth began against the background of a current account surplus. During this period, interest on the part of investors in emerging economies increased, which led to greater activity in the local capital market and a decrease in the Israeli economy's risk premium. Particularly noticeable was the superior performance of the Israeli economy in 2006 despite the outbreak of the Second Lebanon War during the summer of that year. Budget policy in 2003 was aimed at halting the contraction in economic activity that characterized the previous two years while the policy in 2004 and 2005 was aimed at stimulating growth. The policy in 2006 was intended to create the conditions that would preserve it. The means used to achieve these objectives included budgetary restraint, a reduction in the tax burden and structural changes. The main fiscal measures were a cut in transfer to the public, mainly child allowances, and other measures aimed at increasing the rate of participation in the labor market. In view of the continuing internal and external shocks, the targets set for 2003 were to maintain financial stability and halt the contraction of the economy. Up until March of that year, there was uncertainty as to the commitment of the government to stop the growth in the budget deficit. This fact, combined with the stalemate in the political-security situation at the beginning of 2003, led to high real interest rates in the long and short terms; which led to continued recession, a further decline in per capita income and an increase in the unemployment rate. Later that year, the real interest rate began declining as a result of the significant decrease in uncertainty regarding the capability of the government to meet the deficit target it had set for itself. This decline began with the publication of the government's economic plan - “The Israel Recovery Plan,” the approval of U.S. guarantees and the commencement of the peace process, combined with the rapid end to fighting in Iraq. As a result, there was a decrease in Israel's risk premium. The improvement in the monetary indicators (expected inflation and the nominal and real yield curves) enabled the Bank of Israel to gradually reduce interest rates up to the end of the year. The coordinated mix of policies positively effected the expectations of firms and individuals and led to a sharp increase in stock market prices. 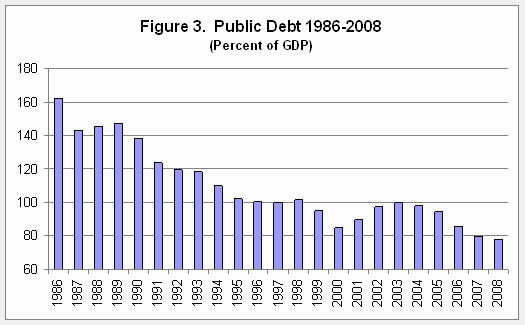 This in turn led to an increase in private consumption during the second half of 2003. The policy of limiting current government expenditure, as implemented in 2003, had two opposite effects: On one hand, it created a decrease in short-term domestic demand (both government and private), which was a result of the decrease in transfer payments and a drop in real public sector wages and, on the other hand, it prompted an increase in demand that followed the sharp rise in stock market prices, which positively affected private consumption. In 2003, there was also a reversal in the trend of both long-term and short-term capital flows (direct investments), which were partly the result of the recovery in the hi-tech industries. The result was an appreciation of the shekel relative to the dollar and, in parallel to the drop in the exchange rate; the year was characterized by significant decline in prices (-1.9%) which was well under 1% - the lower boundary of the inflation target. The years 2003–2007 can be characterized as a period of economic boom and of stability in the capital market with significant changes in capital market structure following the reform of the pension funds and the capital market  , whose purpose was reduced concentration and the minimization of a conflict of interest among financial corporations active in the capital market. With regard to the public’s asset portfolio, the share of the banks was reduced while there was an increase in the proportion of tradable assets; particularly domestic corporate bonds and foreign debt instruments. In the business sector, there was growth in the share of non-bank financing. During this period, there was volatility in the level of prices and the Central Bank intervened when there was a deviation from the inflation target, which was often the result of the strengthening of the shekel relative to the dollar. The year 2003 was characterized by a significant drop in the price level, which was a result of the continuing recession. It was also due to the appreciation of the shekel against the dollar, which followed the reversal in capital flows – particularly of short-term capital – as a result of the interest rate spread in favor of the local economy relative to the developed and emerging economies. In order to raise inflation to within the target range of 1-3%, the Central Bank implemented an expansionary monetary policy, which was manifested in a gradual reduction in the interest rate. However, the policy did not succeed in minimizing the deviation from the inflation target and, as mentioned, 2003 was characterized by disinflation at a rate of -1.9%. As opposed to its previous behavior, the Bank of Israel maintained a relatively low interest rate during the period of 2004–2007, while also keeping a low level of inflation that was within the target or even lower  . The stable level of prices that was maintained for most of the period was also the result of a fiscal policy that supported a reduction in government spending and the financial stability that resulted from, among other things, the stable security situation in Israel and global economic growth. The economy’s risk premium, as measured by the spread between the yield on 10-year Israeli government bonds and comparable yields in the U.S., declined, which made it possible to maintain relatively low interest rates. In 2007, a global financial crisis (the sub-prime crisis) began spreading from the United States to the rest of the world and later affected the global economy. Initially, the crisis was characterized by the collapse of financial institutions in the U.S. In the subsequent stage, the activity of the markets was severely affected and there was a sharp decline in the prices of financial assets. It also led to liquidity and credit shortage and a crisis of confidence in the financial system. The global economy experienced a major slowdown, which began in the U.S. and then spread to other developed economies, particularly in Europe, and later on to Asia and the emerging economies. The crisis led various nations to enact large and often coordinated cuts in interest rates and large-scale programs for fiscal intervention, which grew in size over time. In general, policy responses initially focused on shoring up the financial system and relieving the liquidity shortage. Subsequently, focus shifted to stimulating aggregate demand. These responses are important for understanding the background for the actions of policy makers in Israel in 2008. In 2008, following five years of rapid growth, the Israeli economy began sliding into a recession, as the global crisis worsened. During the year, the upward trends that characterized the period of rapid growth were still apparent; however, the effects of the global crisis, including significant increases in the global prices of crude oil and raw materials, were increasingly felt toward the end of 2008. . The growth rate in 2008 stood at 4%, with demand factors leading the growth. The demand pressure was manifested in a rise in inflation, an appreciation of the real exchange rate and a decrease in the current account surplus. In addition, the unemployment rate declined, nominal wages increased and employment of low-skilled workers expanded. The effect of the crisis in the latter part of the year included a sharp decline in exports and tax revenues as well as a slowdown in the growth rate of private consumption. The downturn during the course of the year could also be seen in the trend of inflation. Until September, inflation remained high as a result of the rise in the global prices of oil and other raw materials and the economy’s surplus demand; while the period subsequent to September saw a steep decline in inflation as a result of the decrease in global prices and the curbing of excess demand. For 2008 as a whole, inflation was 3.8%, which exceeded the upper boundary of the target of 3%. The financial system was also subject to major shocks, although the effect of the global crisis was felt less than in other economies. The intensity of the shocks can be seen in, among other things, a substantial decrease in the prices of shares and corporate bonds and the increase in premiums in the credit market. The shock to the financial system and the increase in risk led to a contraction in the supply of credit and a sharp rise in the costs of raising capital. Monetary policy was largely a response to global developments – the rise in the prices of oil and commodities and the worsening assessments of the severity of the crisis and its effect on Israel. The implementation of monetary policy was not uniform throughout the year. In March and April the interest rate was lowered; from then until September it was raised; and from September until the end of the year it was lowered drastically, reaching its lowest level ever. Simultaneous with the Bank of Israel’s lowering of the interest rate, the increase in risk created the opposite pressure on banks’ lending rates. The Bank of Israel adopted another policy that was not normally used, which involved the purchase of foreign currency in large quantities during the course of the year in order to increase reserves, in response to the accelerated appreciation of the exchange rate. Fiscal policy in 2008 was expansionary, for the first time since 2004, primarily in the form of further reductions in direct tax rates. The combination of this policy with the slowdown in economic activity that lowered tax revenues led to a rise in the deficit. The global crisis had a more moderate effect on Israel relative to other economies. This is explained primarily by the increased resilience of the Israeli economy as a result of the improved implementation of fiscal policy, which involved a controlled rate of growth in expenditure as an anchor for policy, thus making it possible to reduce the deficit and the public debt. The first period – the period of the "Stabilization Plan" (growth) – began in November 1985 and ended in August 1987. Following stabilization, there was a substantial increase in private consumption and total productivity, as well as a significant increase in GDP in the short term. 1 Duration in number of months appears in parenthesis. 2 Annual rate of change in percent. This was followed by a period of “post-stabilization” (recession) which began in September 1987 and ended in December 1989 with the beginning of the mass wave of immigration. This period was characterized by a restructuring of the economy, which involved the elimination of structural distortions created during the period of high inflation. This was followed by the “Immigration Period” (growth) which commenced in January 1990 and ended in April 1996. During this part of the cycle, the economy benefited from the fruits of the Stabilization Plan, in parallel to the implementation of a wide range of economic reforms. The “Period of restraint” (slowdown) began in May 1996 and ended in July 1999. This slowdown began about 18 months after the adoption of a very tight monetary policy at the beginning of 1995 with the objective of reducing inflation. This policy had a significant impact as the effects of the mass wave of immigration began to peter out and the construction industry began to contract. At the beginning of 1997, a restrictive fiscal policy was adopted, which, together with the monetary restraint and the waning effect of the mass wave of immigration, had a prolonged moderating effect on economic activity, which lasted for a period of three years. The “Hi-tech boom” (growth) began in August 1999 and ended abruptly in September 2000. This stage of the cycle was characterized by an endogenous transition from slowdown to growth, but its conclusion was the result of external shocks: the crash of the NASDAQ and the beginning of the intifada. This cycle was characterized by non-uniform growth which was led by the hi-tech industries, whose output is mainly destined for export. The next stage of the cycle, the “Great crisis” (recession), which began in October 2000 and ended in August 2003, was characterized by an unprecedented recession that resulted in a decrease in real GDP. This stage was a result of external shocks, as described above. The subsequent “Growth and recovery” stage (growth) from September 2003 to May 2008 was characterized by a rapid increase in per capita income, a decrease in unemployment, the achievement of deficit targets by the government, low inflationary pressure and a robust banking system. This can be viewed against the background of an improvement in the management of government policy, a loosening of monetary restraint on the part of the Bank of Israel and an increase in global trade. And finally, the “Global crisis” (recession) has lasted from June 2008 until the present time. This stage of the business cycle can be explained by the global financial crisis, which began in the United States and then spread to the entire world. 2. Avi Ben Bassat, “The Exchange Rate Regime, Monetary Policy and the Inflation Target”, Bank of Israel, Discussion Paper Series, 95.10. 3. Y. Ben Porath, The Israeli Economy – Growth Pains, 1989, Am Oved. 4. N. Halevi and R. Klinov. The Economic Development of Israel, 1968, Academon. 5. Nissan Liviatan and Haim Barkai, The Israeli Economy from a Historical Perspective, 2004, “Bank of Israel: 50 Years of Striving for Monetary Control”. 6. Rafi Melnick, “Business Cycles, Fiscal and Monetary Policy in Israel”. The Economic Quarterly 3/2002. 7. D. Patinkin. The Israeli Economy in the First Decade, 1960, Falk Institute. See the Bank of Israel Annual Report 2008, Chapter 7, Box 7-1. The reforms came into effect in 2005 in particular the Bachar commission reform. With the exception of 2006, in which inflation stood at -0.1%; in 2004, 2005 and 2007 it was within the target. For a description of the period from 1985 to 2002 see: Rafi Melnick, “Business Cycles, Fiscal and Monetary Policy in Israel”, The Economic Quarterly (2002), 3, 49.